The wizards prompt you to enter the settings needed for that particular type of project and create the necessary files for you. To display other types of files in the Projects pane, specify them in the project file. Select File > New File or Project and select the type of your project. The contents of the following dialogs depend on the project type. Follow the instructions of the wizard. 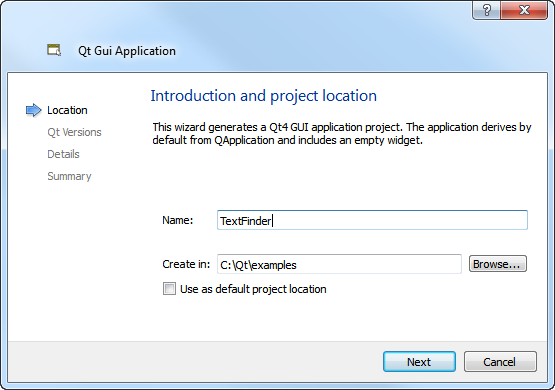 This example uses Qt Gui Application. Name the project and set its path. To select the path from a directory tree, click Browse. Avoid using spaces and special characters in the project name and path. Specify the name of the class you want to create and using the drop-down menu select its base class type. Note that the Header file, Source file and Form file fields are automatically updated as you name your class. To create the project, click Finish. 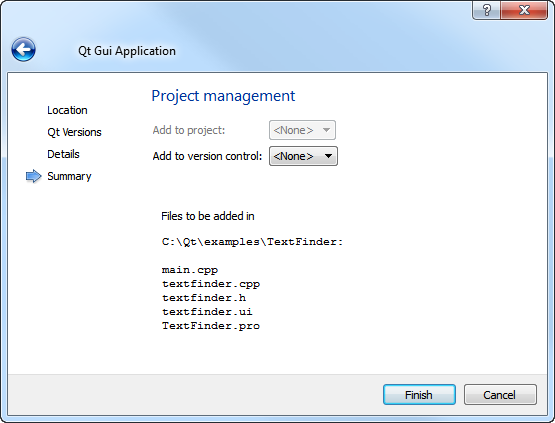 Qt Creator determines whether to display files from the project folder in the Projects pane depending on the file type (.pro, .pri, .cpp, .h, .ui, .qrc, and so on). To display other types of files, edit the the project file. Add filenames as values of the OTHER_FILES variable. You can also use wildcards. This also makes the files available in the Locator. If you have a team working on a large application or several applications, you might want to standardize the way the team members create projects and classes. You can use the wizard templates in the share/qtcreator/templates/wizards folder to create your own project and class wizards. Qt Creator looks in the folder and adds all wizards defined in wizard.xml files to the New dialog that opens when you select File > New File or Project. In a project wizard, you can specify the files needed in a project. You can add wizard pages to allow developers to specify settings for the projcet. In a class wizard, you can allow developers to specify the class name, base class, and header and source files for the class. To see how this works, rename wizard_example.xml as wizard.xml in the helloworld and listmodels folders. 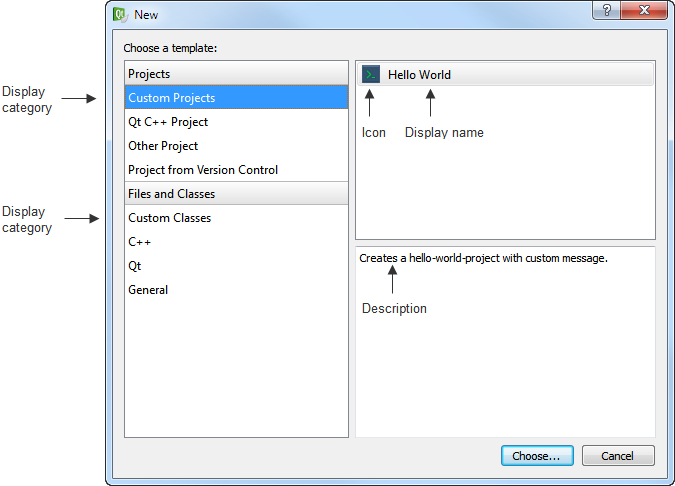 After you restart Qt Creator, the Custom Classes and Custom Projects categories appear in the New dialog. Make a copy of the share/qtcreator/templates/wizards/helloworld or share/qtcreator/templates/wizards/listmodel folder. version is the version of the file contents. Do not modify this value. kind specifies the type of the wizard: project or class. class specifies the type of the project. 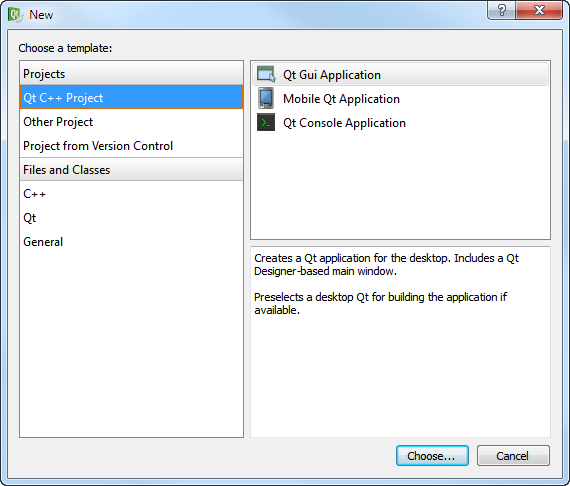 Currently the only available type is qt4project, which specifies a Qt console project. firstpage specifies the place of the new page in the standard project wizard. The value 10 ensures that the custom page appears after the standard pages, as the last page of the wizard. id is the unique identifier for your wizard. The letter specifies the position of the wizard within the category. The HelloWorld wizard appears as the first wizard in the second category in the New dialog. category is the category in which to place the wizard in the list. The letter specifies the position of the category in the list in the New dialog. icon appears next to the displayName. description appears at the bottom of the New dialog when you select the display name. displayName appears in the New dialog, under the displayCategory. You can add translations as values for the text elements. Specify the target language as an attribute for the element. Use locale names (QLocale). For example, xml:lang="de". source specifies the file to copy to the project. The files must be located in the wizard folder. target specifies the new filename for the file. The %ProjectName% variable is replaced with the string that users specify in the Name field on the first page of the wizard. openproject indicates that the file is a project file which is to be opened after the wizard has finished. openeditor indicates that the file is to be opened in an editor after the wizard has finished. fieldpagetitle specifies the title of the page. field specifies whether the field is mandatory (true or false). You can use the value of the name field as a variable in other files (for example, %MESSAGE%. fieldcontrol specifies the field. class specifies the field type. You can use interface objects from the QWidget class to create fields. This example uses QLineEdit to create an input field. validator specifies a regular expression to check the characters allowed in the field. defaulttext specifies text that appears in the field by default. fielddescription specifies the field name that appears on the wizard page. The widget.xml file for a class wizard is very similar to that for a project wizard. The differences are discussed below. For more information about the elements and their values, see Creating Project Wizards. %ClassName:l% is replaced with the value of the ClassName field. The modifier l converts the string to lower case, to observe Qt conventions. %CppSourceSuffix% is replaced by the default source suffix, which is defined in Qt Creator in Tools > Options... > C++ > File Naming. For example, if users enter MyClass, the filename becomes myclass.cpp when the project is created. %CppHeaderSuffix% is replaced by the default header suffix, which is also defined in File Naming. Here, the filename would become myclass.h. 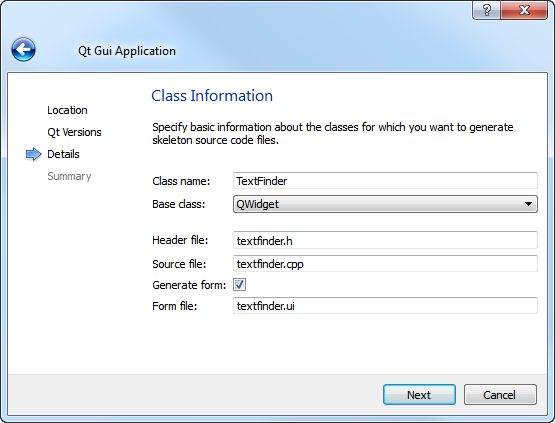 In addition to QLineEdit, QComboBox is used in the class wizard to create a field. combochoices specifies the options in the combobox and defaultindex specifies that QString is the default value.